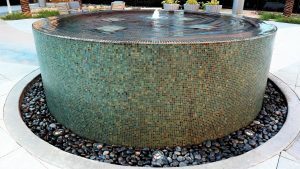 Stevens Leinweber and Ancon water features contacted DMTM to install glass mosaic tile at the Sky Harbor courtyard fountain. This is a negative edge feature and required specialized jigs and mortar floating to provide both a true round shape but also a perfectly level spill way. Our senior Foreman Steve Baca was put in charge of this project and produced a great end product.